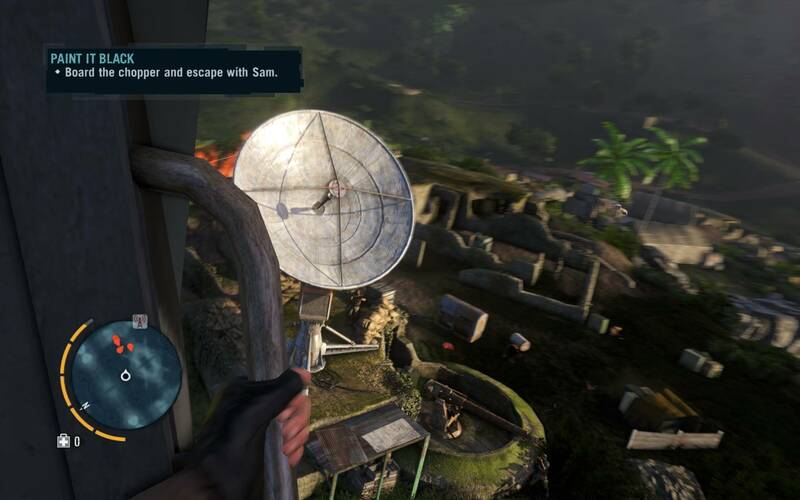 Far Cry 3 Paint It Black follows the All In main story quest. After you earn Hoyt’s trust you and Sam agree that the only way to destroy Hoyt is to first weaken his organization. You will do that by destroying his communications center and his fuel depot. The communications center can be found west of Charlie Camp. The bunker door you need to plant the bomb on can be found deep inside the privateer’s complex. You can sprint straight to the door, plant the charge, and blow the door open without killing all the privateers if you like. Just make sure to take cover before you blow the door, the blast radius is large and you don’t want to injure yourself. Rushing to the door can cause this. After you enter the bunker the door you just came through will get blocked by falling stones. Within the bunker there will be many privateers, including ones with flame throwers. Take them out as you push forward. You can exit from the bunker here. You will spot the satellite dish as you head up and out of the bunker. Make sure to take care of all the enemies, especially the ones with sniper rifles, before heading towards the dish. Place an explosive device on the satellite. At the bottom of the satellite dish there is a yellow spot that indicates where you should place the explosives. Be sure to have full health and every weapon reloaded before you plant the bomb. As soon as you place your explosive the privateers will start attacking you in large groups. You need to defend the explosives until Sam arrives. As soon as Sam lands with as a chopper head over and get it. When you are at safe distance you will receive an option to activate the explosives remotely. Hit the button and watch the dish explode.